Getting Skunked turns into a great day on the water! I got up super early this morning and went to pick up Deuce for an early morning Waikiki session. He had to work at 9am, so we motored to the Lorne, put in above and paddled down. On the way down, we checked to see if ‘Gnar’burator was in, but it wasn’t. Waikiki wasn’t that great either, and the wave train below it was more boily and swirly than I had ever felt it! We ended up getting skunked. I dropped Deuce off at Sharky’s, and went home for some breakfast. Around 11ish, I met up with Jamie Heard at the McCoy’s put in and after running shuttle, we decided it would be a good day to run the Middle Channel. As he had never paddled with me before, I told him that I was fine on every section of the Ottawa, but still got nervous whenever running McCoy’s. Even though I have run McCoy’s alone, and never swam there, it still makes me nervous for some reason. I decided to punch Satler’s that day and we went through and down to horseshoe. After looking at left-side for a minute, I suggested that it might be fun to surf. We tried a couple of times and couldn’t catch it, but then discovered if we approached it sideways instead of facing upstream, we could get on! We stayed there for a while, the surfer’s left side was friendly and we were spinning away, having a grand old time. After a while we decided to head on down. Jamie had guided rafts for Owl and knew the river like the back of his hand. He led me down ‘Little Trickle’ even though the water was low, and it was a fun little shortcut around Iron Ring. I didn’t even go down the loser’s channel! We stopped at Angel’s Kiss, which was super-low and not that much fun. I hand surfed it once, and then we moved on. We checked out Butterfly, waved hello at the SRT course going on the shore and headed to Garvins. Today we decided to run the far left chute (WT Chute?). It was shallow and rocky, but definitely doable. We stopped at the upper No Name wave and hiked back up to surf a few times, and then made our way down through Lower No Name. At Black Velvet we had a competition to see who could last the longest running the rapid with our eyes closed and paddle on our head. First person to hit a paddle blade to the water was the loser! Well we passed the rapid and were in flat water, but neither of us were giving up! 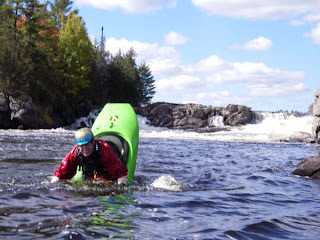 I even put my paddle through my PFD and started hand-paddling because we were going nowhere fast! In the end, Jamie broke down and slapped his paddle on the water, which ended a perfect day on the river!